NOTE TO STUDENTS: This is a long commentary, but it presents questions well worth thinking through. We hope you take the time to read it and consider some of the concerns Mr. Arthur presents. How will we behave in groups when the distraction of the internet is only an eye movement away? Still, you might think, where's the harm? The thing is, though: this is Google, the company that has repeatedly breached the boundaries of what we think is "private." For Google, "privacy" means "what you've agreed to," and that is slightly different from the privacy we've become used to over time. So how comfortable - or uneasy - should we feel about the possibility that what we're doing in a public or semi-public place (or even somewhere private) might get slurped up and assimilated by Google? You can guess what would happen the first time you put on Glass: there would be a huge scroll of legal boilerplate with "Agree" at the end. And, impatient and uncaring as ever, you would click on it with little regard for what you were getting yourself, and others, in to. Can a child properly consent to filming or being filmed? Is an adult, who happens to be visible in a camera's peripheral vision in a bar, consenting? And who owns - and what happens to - that data? "The idea that you could inadvertently become part of somebody else's data collection – that could be quite alarming. And Google has become the company which knows where you are and what you're looking for. Now it's going to be able to compute what it is you're looking at." The obvious objection to privacy concerns is that we're used to being filmed; surveillance cameras are part of life. Yee's response: "Not 5,000 cameras a city - five million. Not 5,000 monitors - one." 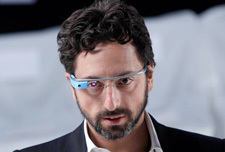 Where the five million are the wearers of Glass - and the one monitor is Google, aggregating, sifting, profiting. "Your one-on-one conversation with someone wearing Google Glass is likely to be annoying, because you'll suspect that you don't have their undivided attention. And you can't comfortably ask them to take off the glasses (especially when, as it inevitably will be, the device is integrated into prescription lenses). Finally - and here's where the problems really start – you don't know if they're taking a video of you." "How much more will we have of this now that it is made so simple for us? And the other side of the coin: how much are we going to share with others, and at what point will we have a backlash? When will it all be too much?"